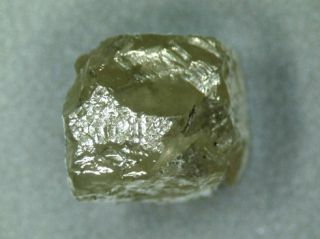 A photo of unpolished natural diamond. One of the hurdles in origin-of-life theories is that thepieces that make up complex biomolecules do not readily come together bythemselves. A group of scientists proposes that diamonds provided a kind of"workbench" for biomolecule manufacturing on early Earth. Not long after its formation, our planet was — according toastrobiologists — awash in a primordial soup that contained the rudimentaryingredients of life. The fly in the "soup" theory, however, isthat the small molecular bits likely needed outside help in order to latchtogether into the long, complex biomolecules that living organisms use. Some scientists have suggested that the surfacesof minerals on the early Earth provided an organizing platform upon whichthe building blocks of life could assemble.? Recent studies of diamond suggest thatits surface would be especially good for this. "Diamond is totally non-toxic,an excellent biomaterial and certainly the only naturally existing materialthat is completely biocompatible on all levels — presumably the best of allpossible platforms for the formation of life," said Andrei Sommer from the University of Ulm in Germany. Hydrogenated diamonds are just diamonds with an outercoating of hydrogenatoms, but they are not something you'll find in your local jewelry shop. Infact, the only hydrogenated diamonds currently known are all made in the lab. "In nature, diamond hydrogenation is likely to occur inor in the vicinity of volcanoes known to emit a variety of hot gases includinghydrogen," Sommer said. The early Earth had so much volcanic activity thathe thinks it is highly probable that hydrogenated diamonds existed back then. Sommer and his collaborators previously showed thathydrogenated diamond is very hydrophobic, or "water fearing" —meaning it pushes water away. When hydrogenated diamond is wetted, the watermolecules line up on the surface as if they were frozen into a crystal layer(an analogy might be static electricity making all the hairs on your head pointout). Surprisingly, these crystal water layers do not disappearwhen the hydrogenated diamond is fully immersed in water. Because this is theonly natural material known to exhibit this behavior, Sommer's team proposesthat small organic molecules in the primordial soup landed on hydrogenateddiamond and were helped by its robust crystal water layers into linkingtogether to form proteins and DNA. Support for this idea comes from a recent study that foundthat certain nucleobases (the building blocks of DNAand RNA) form an organized pattern on the surface of graphite, which ischemically similar to diamond. Hydrogenated diamond should be a better organizing platformthan graphite, Sommer said. This is because the crystal layers that form on itare not static; they change with temperature and light intensity. The resultingfluctuations could have helped drive the development of novel molecules in theprimordial soup. "So far, crystal water layers haveonly been described on hydrogenateddiamond," said Horst-Dieter Foersterling of Philipps University of Marburg,who was not involved with this work. "This is a new field of research.That this system can be helpful for the formation of biomolecules is aplausible hypothesis." It remains uncertain whether there was any hydrogenateddiamond on Earth billions of years ago, but even a little bit might be enough. "I think it is not important that a lot of hydronenateddiamond was available," Foersterling said. "Once the first evolutionprocess has started in a very special location [such as a tiny patch ofhydrogenated diamond], and stable DNA strands have formed, a special locationis no more necessary." Greatest Mysteries: How Did Life Arise on Earth?